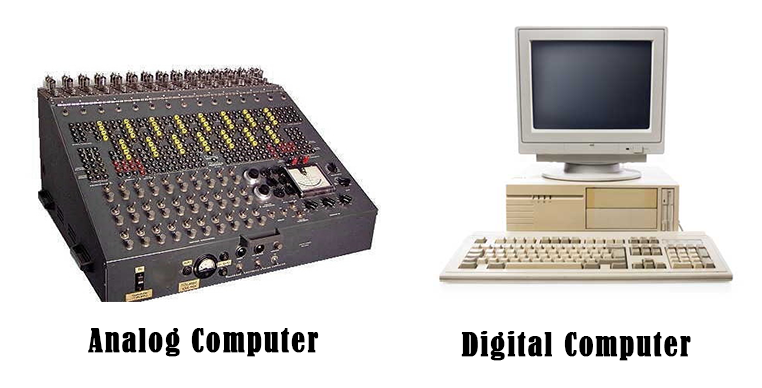 Differences between analog and digital computers. Analog Computer: An analog computer is a form of computer that uses the continuously changeable aspects of physical phenomena such as electrical, mechanical, or hydraulic quantities to model the problem being solved. As an analog computer does not use discrete values, but rather continuous values, processes cannot be reliably repeated with exact equivalence. Digital Computer: A digital computer is form computer that uses letters and numbers as inputs in processing and displays the result in monitors or other forms of output devices and can also store the output in memory to be used later. This type of computer uses continuously changeable aspects of physical phenomena. This type of computer runs by turning on and off electricity which are digital signals. Electrical wave generated from pressure, temperature etc. such changeable data are used as input in analog computers. Letters and numbers are used in digital computer to process data. Analog computer uses physical devices like plotter etc. to display the output of an operation. Digital computer can display output to monitor or on other devices. Analog computers are less accurate. Generally all modern computers are digital computers such PC, laptop, notebook etc.